Artificial intelligence encapsulates a broad set of computer science for perception, logic and learning. 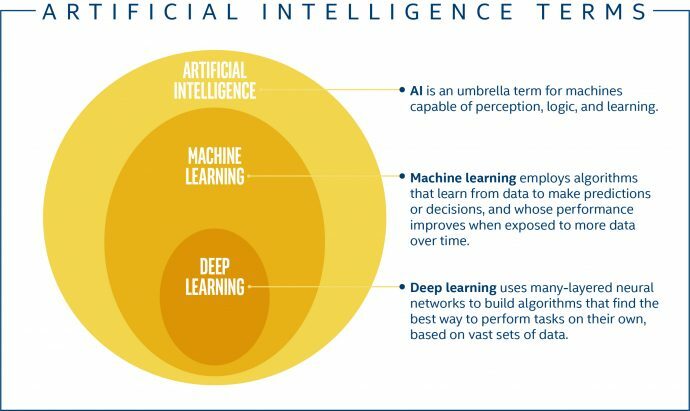 One method of AI is machine learning – programs that perform better over time and with more data input. Deep learning is among the most promising approaches to machine learning. It uses algorithms based on neural networks – a way to connect inputs and outputs based on a model of how we think the brain works – that find the best way to solve problems by themselves, as opposed to by the programmer or scientist writing them. Training is how deep learning applications are “programmed” – feeding them more input and tuning them. Inference is how they run, to perform analysis or make decisions. There are a lot of ways to define artificial intelligence – mostly since “intelligence” alone can be hard to pin down, but also because people ascribe AI to everything from the grandiose to the matter-of-fact. Intel Fellow Pradeep Dubey calls artificial intelligence “a simple vision where computers become indistinguishable between humans.” It has also been defined as simply as “making sense of data,” which very much reflects how companies are using AI today. In general, AI is an umbrella term for a range of computer algorithms and approaches that allow machines to sense, reason, act and adapt like humans do – or in ways beyond our abilities. The human-like capabilities include things like apps that recognize your face in photos, robots that can navigate hotels and factory floors, and devices capable of having (somewhat) natural conversations with you. The beyond-human functions could include identifying potentially dangerous storms before they form, predicting equipment failures before they happen, or detecting malware – tasks that are difficult, or impossible, for people to perform. A team of people at Intel, the Artificial Intelligence Products Group, are working to deliver the hardware, software, data science and research to bring these new capabilities to life. Work in AI dates back to at least the 1950s, followed since by several boom-and-bust cycles of research and investment as hopes grew for new approaches and applications (like Arthur Samuel’s 1950s checkers program and Stanford’s 1960s Shakey robot) and then fell as these methods failed to pan out (leading to “AI winters,” when investment and public interest went cold). There are four big reasons that we’re in a new AI spring today: more compute (the cloud puts high-capacity computers in reach for all), more data (particularly as cameras and sensors proliferate), better algorithms (approaches have moved from academic curiosities to beating human performance in tasks like reading comprehension), and broad investment. As Intel’s Dubey explains it, machine learning “is a program where performance improves over time,” and that also gets better with more data input. In other words, the machine gets smarter, and the more it “studies,” the smarter it gets. Using machine learning, a major eye hospital in China was able to improve detection of potential causes of blindness, typically 70 to 80 percent for clinicians, to 93 percent. For instance: an AI-powered ophthalmoscope (a digital version of the device a clinician would use to see the inside of your eyes) built by Aier Eye Hospital Group and MedImaging Integrated Solutions learned how to identify diabetic retinopathy and age-related macular degeneration (both of which can lead to blindness) by “looking” at thousands of labeled images of healthy and unhealthy eyes. An early analysis based on data from 5,000 Aier patients showed that detection accuracy, which had averaged 70 to 80 percent for screening conducted by humans, jumped to 93 percent with the AI solution. With more time and more data, its accuracy should continue to rise. 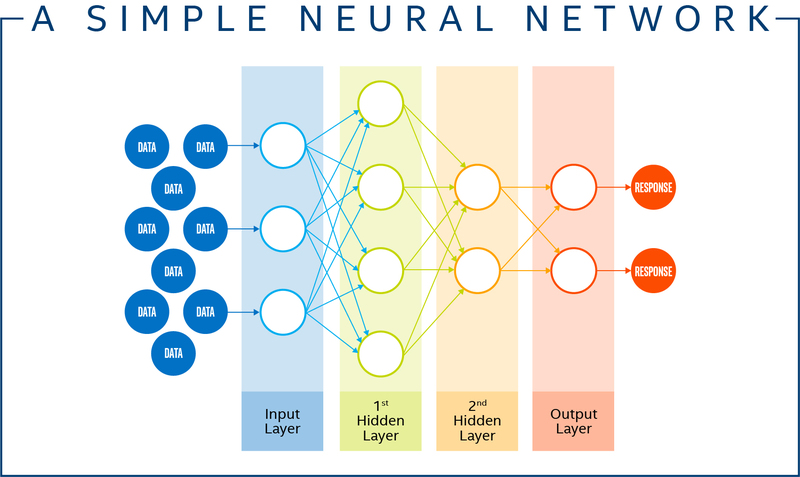 Neural networks and deep learning are very closely related and often used interchangeably, but there is a distinction. Most simply, deep learning is a specific method of machine learning, and it’s based primarily on the use of neural networks. “In traditional supervised machine learning, systems require an expert to use his or her domain knowledge to specify the information (called features) in the input data that will best lead to a well-trained system,” wrote a team of Intel AI engineers and data scientists in a recent blog. In the blindness-prevention example, that’d mean specifying the colors, shapes and patterns that separate a healthy eye from a troublesome one. In other words, Aier’s eye-health screener might not “see” conditions at all like a human clinician does, though it’s still more accurate. That’s what makes deep learning so powerful – given enough good data, it can be used to solve problems with unprecedented dexterity and precision. The important part is this: The neural network allows the program to break a problem down into smaller and smaller – and therefore simpler and simpler – chunks. “Deep” in deep learning delineates the use of a many-layered neural network. With more layers, the program gets more refined in what it can categorize and more accurate in doing so – it just requires more and more data and more and more compute power. The concepts sound complex, but when it comes to the actual code that runs, it’s actually pretty simple. “It’s not magic – it’s math,” said Dubey. Matrix multiplication, to be exact, “as simple as it gets,” added the Intel Fellow. OK, there are two more quick concepts worth noting: training and inference. Training is the part of machine learning in which you’re building your algorithm, shaping it with data to do what you want it to do. This is the hard part. In the case of Aier’s eye screener, for example, training involved feeding in those pictures of eyes labeled as healthy or not. And then there’s inference, which fits its dictionary definition to the letter: “The act or process of deriving logical conclusions from premises known or assumed to be true.” In the software analogy, training is writing the program, while inference is using it. “Inference is the process of using the trained model to make predictions about data we have not previously seen,” wrote those savvy Intel folks. This is where the function that a consumer might see – Aier’s camera assessing the health of your eyes, Bing answering your questions or a drone that auto-magically steers around an obstacle – actually occurs.